It is troublesome to re-configure all apps in your new smartphone, so why don't you backup these apps and app data, then restore them to the new device? Actually, you can backup your app data from an old phone and restore it on the new one via different ways, and some of them are really easy to use. Today's post is going to show you 3 different ways to backup app data on Android, and you can compare them and pick up the best one to backup or restore app data in Android as you like. Note: No matter your device is rooted or not, the solutions are all working well on it. But you should know that apps can only be restored on Android devices that are running on the same system. That means you cannot restore the backed up apps or app data to an iPhone or BlackBerry phone. With iSkysoft Toolbox - Backup&Restore (Android), you can be assured to never lose your data (be it apps/app data or photos, videos, music etc.) 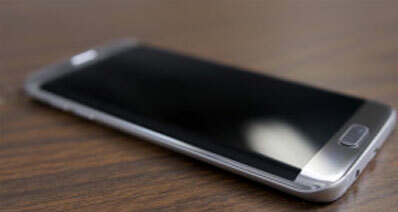 again even if you have to switch your old Android device with a new one. It is an amazing one stop solution for help you with your backup and restore needs. 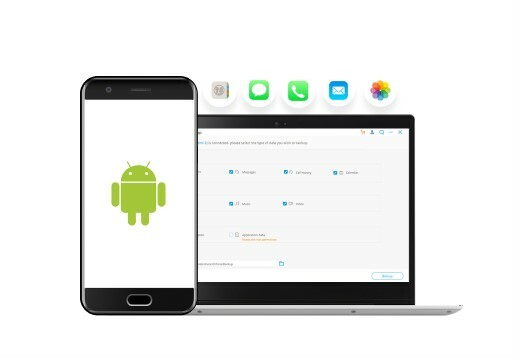 With this powerful tool, you can easily backup and restore app data from one Android device to another in just a few simple clicks. Moreover, this tool is trusted and recommended for its productivity across the Globe. Easily back up your entire apps and app data device from Android to PC or Mac within few simple clicks, and you can choose to restore selective apps to your new device. Not only applications, other data types such as contacts, messages, photos, videos etc. are also supported. 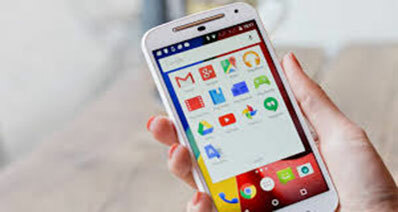 The tool aptly supports more than 6,000 Android devices and all major Android versions. Unlike other softwares, this tool never replaces any of the old backup files with the new one. 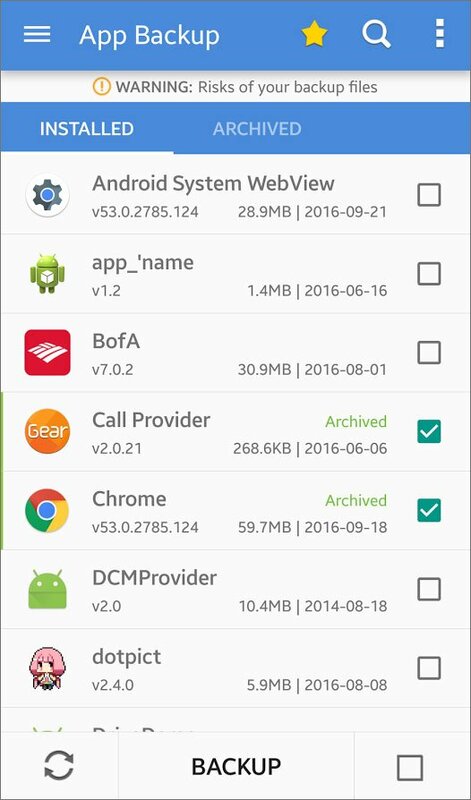 How to Backup & Restore App Data on Android Easily? Make sure to download and install the program, then launch it. When you see the main interface, and select "Data Backup & Restore" directly. 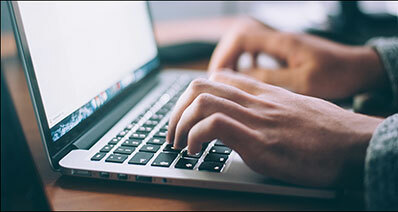 Connect your device with a genuine USB cable and tap "OK" if you see a pop-up requesting the USB debugging on your device. 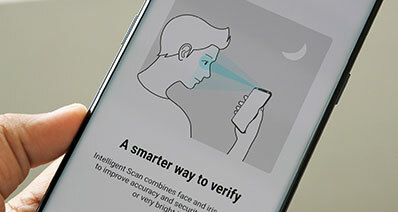 Your Android device will automatically be recognized by the software. You now have to click "Backup" to initiate the process. Next, all the data types available on your device will be presented to you category wise. Choose "Application data" followed by "Backup". After completion, you can see the backed-up data by clicking "View the Backup" button. Just make sure to keep your Android device and computer connected during the entire process. Note: Since the app data contain your personal privacy info, so they always be stored in the phone's internal memory. And in order to get access to these data, your Android device is required to be rooted, otherwise, the program may fail to detect your app data successfully. Why I need to root Android device? How to root Android devices easily? 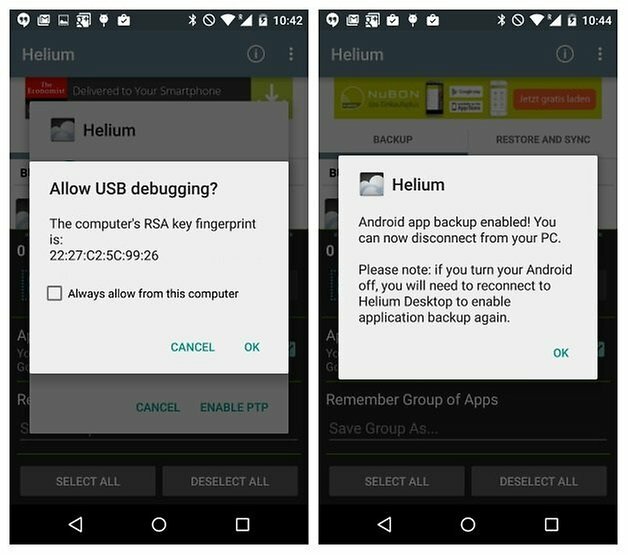 How to Backup App Data on Android with Helium? 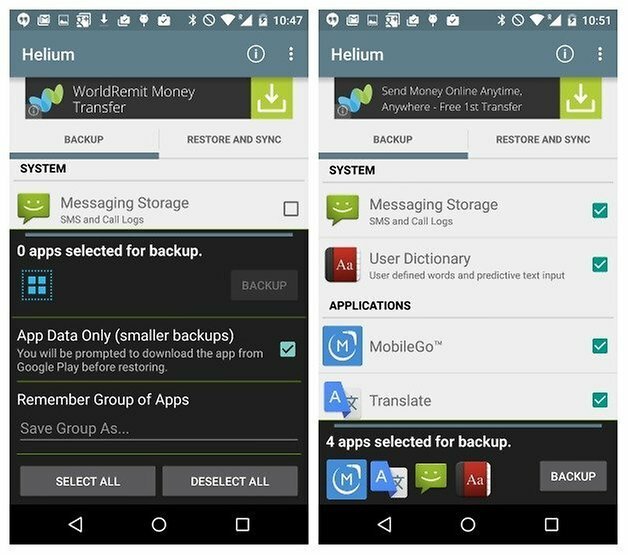 Helium is one of the popular apps through which you can backup app data without root for android. To use the app, you however, also need to install Helium Desktop on your PC. The app is compatible with Windows, Linux and Mac OS X. Windows user must take care of the following points before using the app. Make sure to install Helium Desktop and all relative drivers for it. 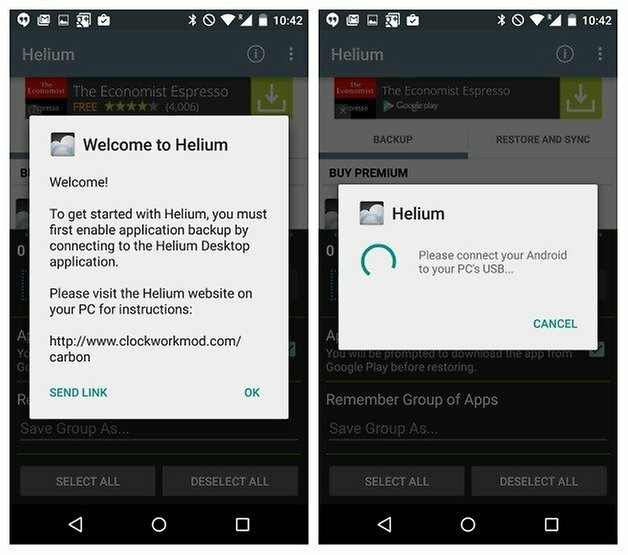 Your old Android phone should have Helium app installed in it. Launch Helium Desktop on your operating system. Note that the phone should not yet be connected to your PC. In the developer options in your phone, you will find the USB debugging option. Enable it so as to provide necessary permissions in order to backup app data without rooting android. Ensure to properly enable USB debugging if your device isn’t detected by Helium. This might also happen because your computer is not installed with proper ADB drivers. In such a case you need to visit the Developer website to resolve the issue by getting the ADB drivers from the website. For example, for Sony users, you need to visit the Sony Developer website and get the relevant ADB drivers from there. Step 2: When your PC detects your phone, allow USB debugging on your device and then disconnect it from the PC. 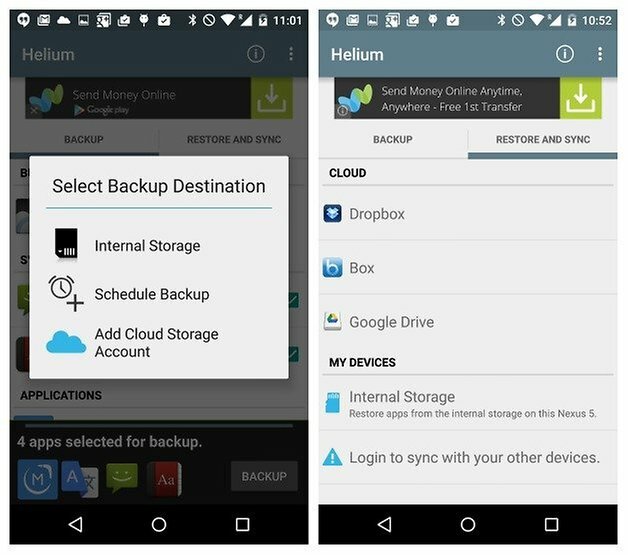 Step 3: You now need to go to Helium app on your phone and select the preferred apps you want to backup app data of. Tap on "Select All" if you want to backup all and then hit "Save". Step 4: The backup can be saved in the internal memory or SD card according to your own needs. Choose the one and wait for a little while, you will be notified on its completion. How to Backup App Data in Android with Apex Backup & Restore? App Backup & Restore is yet another powerful and genuine app to perform App Backup or Restore. This app has been rated with 4.5 stars ratings on Google Play Store. Users can easily save their backup data either to their SD card storage or on the cloud account, keeping the backed up apps safe until when you want to restore the app again. All they are required to do is just simply select the App they feel like saving and it's done. 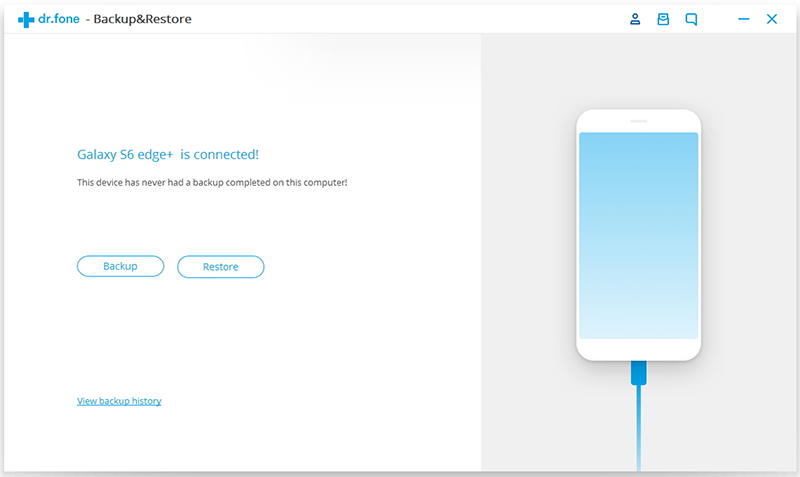 App Backup and Restore provides a hassle-free, clean and sophisticated user interface, making your app backing up experience much smoother. This App Backup & Restore app is available for freely on the Google Play store. 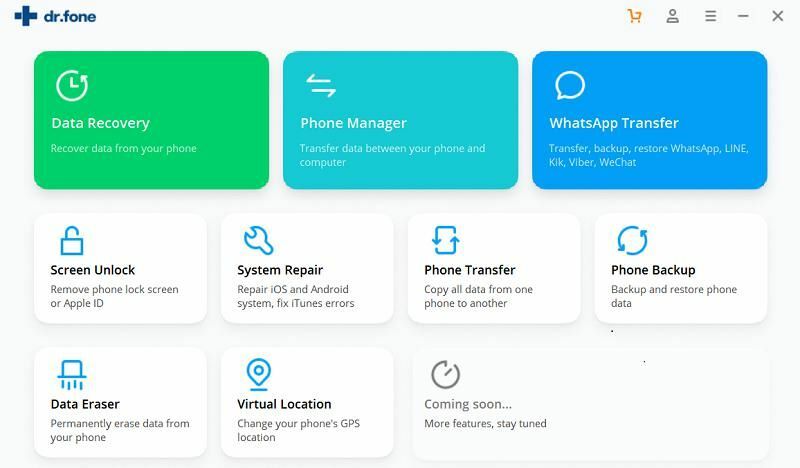 Although the app developer claims that this app is capable of backing up app data but there are some recent issues reported that the app doesn't backups app data and hence has the same drawback as that of aforementioned app above. 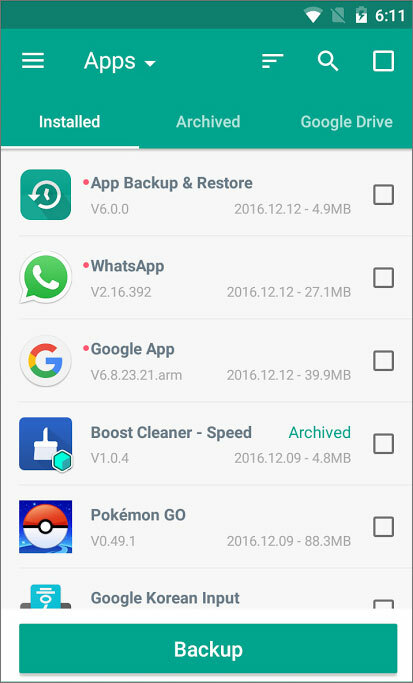 How to Backup Android App Data with Trustlook App Backup & Restore? App Backup Restore is amongst the easiest backup performing apps. An app that surely does what it was designed to do, rated with 4.3 stars rating in the Google Play Store. The feature that puts the spotlight on this app is that it is swift and quite fast in performing data backup operations. Besides this, it not only backup and restore APKs but is capable enough to directly store the backups to the external SD card storage or on a cloud account. Along with these, it also can perform auto-backup, show up system stats and much more. 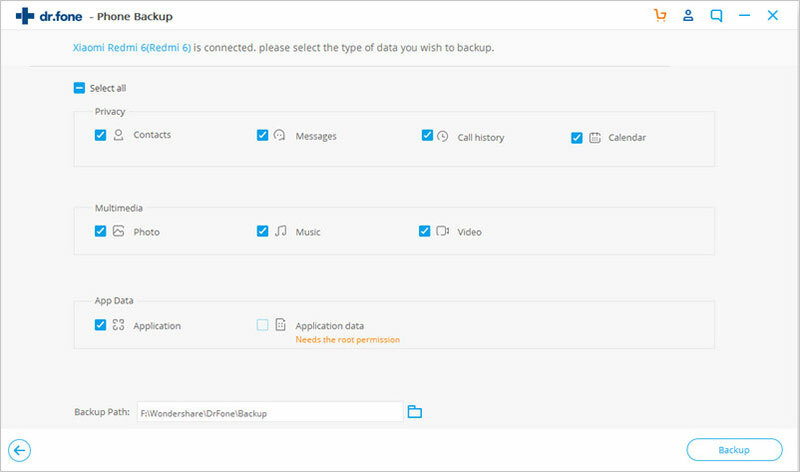 In addition to APK backup, it also supports backup of the user's personal data like contacts, messages and call logs. Moreover, App Backup and Restore allows the user to send or receive apps over the WiFi to your known persons. On top of that, it also comes with a night mode feature that protects your eyes from the harmful brightness of the screen when operating it in a dark room or at night. Well, it has only one drawback that it is not capable of backing up the App's Data. So, it could be one of ideal option to backup app data on Android devices without root. How to Transfer Data from Blank Screen Samsung to Computer Easily?